Through digital curation we collect, manage and collate the best, most relevant content, on a specific topic or theme, for ourselves and share with others. 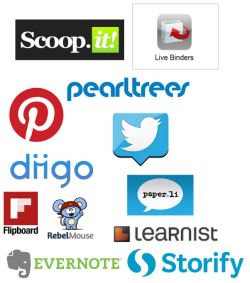 Using tools like Scoop.it, Pinterest, Diigo and Livebinders educators collect the best resources to put them into context with organisation, annotation and presentation. It’s no longer just about creating content. We are living in an era of content abundance. It’s now about finding and putting content into a context, in a meaningful and organised way, around specific topics. News discovery tools select and aggregate the content while the curation tools are used to display your content with context with organisation, annotation and presentation. News discovery tools are all about saving time by feeding you the most relevant content. There are a gazilion tools you can use. ; and which tools you use, and how you curate, is a personal as the tools you use to build your personal learning network (PLN). You can check out examples of the different tools used by educators to curate in our Digital Curation – use in education storify or share information on how you curate by participating in our Digital curation survey. Check out Curation: The Next Big C by John Pearce. My main curation tools are: my blogs ( The Edublogger, Edubogs Teacher Challenges, Sue Waters); Flipboard; Pinterest; Storify; and Twitter. Flipboard was originally designed as a social network aggregation, magazine-format app for iPad in 2010. It is now the most popular of the magazine-like content aggrregator apps for iOS, Android, Kindle and Nook. It allows me to easily aggregrate content from a range of different sources. Quickly curate and share articles I like directly to my own magazine from within Flipboard (or using the Flip It bookmarklet in your web browser) while also sharing the articles with with social networks at the same time! Here’s a quick video on how I use Flipboard magazines to find, curate and share content. Pinterest is a pinboard-style visual booknarking website that allows users to create and manage visual content. You can share images or videos you find online, or you can upload images directly to Pinterest. Examples of Class blogs – whenever I see a class blog that showcases specific aspects of blogging I take a screenshot of the blog, upload the image and pin it to the blog URL. Helpful Blogging videos – includes videos from a range of different sources. Curation in Education – my latest board created for this presentation. Here’s a quick video on how to use Pinterest. I use Storify as a way of pulling information shared on a topic in Twitter into one locate where I can refer back to it later. For example. I asked my Twitter network to share “Do you curate? What tools do you use? Why you curate? Why you don’t curate? Are you confused by what is digital curation?” and then pulled their answers into this Digital Curation – use in education storify. Here’s a quick video on how to use Storify. How do you curate? What advice would you give others on curating content? Is there anything I’ve included that you want covered in more detail? 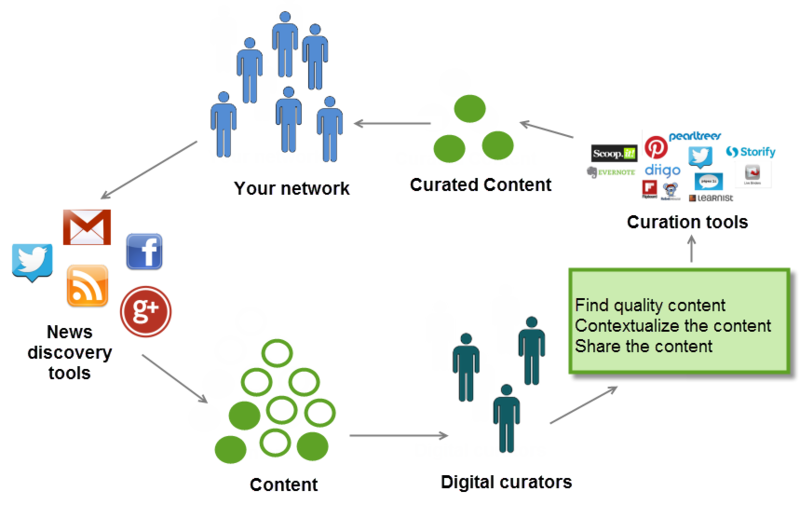 Thank you Sue for a most useful post which provides an excellent summary and introduction to the concept of digital curation. I have to run a digital curation session this week for new research students and I will certainly be directing them to your blog post. Thanks so much for this, Sue. I find that when I speak to teachers (and most recently, student teachers), this is the part of the equation many haven’t thought about. Where do I put the great stuff I’m finding, and, if they’ve thought about it, how should they share it? This is a nice resource to get people started thinking. I’m a big fan of RebelMouse myself, and often use Pocket as an in-between stage, to help me filter what I’d like to keep and share. My next step is the “purging” stage – how to regularly look through what I’ve curated, and see what I need to do with it. Sue, thank you for this great post and all of the resources you shared here! I have been wanting to help educators I work with learn about how they can organize all of the resources they are finding online. Your post will be of great value to me as I pull together ideas to share with them. Also you have inspired me to try Pocket again. Now, I am off to curate and share this post! Oops! I meant to say you’ve inspired me to try FLIPBOARD again. I constantly mix up Pocket & Flipboard for some reason! Argh! I also use Flipboard and Pinterest. But the best by far, and what I use every day, is Pocket (formally known as Read It Later). I know Lisa mentioned it above, but let me go through it. Ok, so if I’m flipping through my twitter from, say Flipboard, and come across an article that sounds great, but I want to read it later, I simply click on the Read It Later option. That adds it to a Pocket account that is already set up. I also have the add on loaded on my Firefox PC computer and iPad/iPhone safari app as well. Same principle. I see something I like, I press the button and it gets added to my queue. I can read from my list, either through the Pocket iPad app which displays all my articles (with the ability to filter by tags if you like) or there is a dropdown button loaded on my PC browser (as part of the Pocket add on to Firefox) that goes through them. Once I’m finished, I click the check mark and it disappears from my queue. I use it constantly! Highly recommended! Thanks for your lovely feedback and glad that my post from the curation session has helped! The best part of the whole process of organizing for a presentation is I also learn and it helps me reflect on my own practices. The Curation survey ( http://theedublogger.com/2013/10/11/digital-curation-survey/ ) which I hope to share soon has highlighted the extent of our preferences to which tools we use to curate and has helped me reassess some of the tools I’m not using. I’ve also been reflecting on the popularity of Diigo and Scoop.it Pros and cons of adding in more curation tools vs time and gain. @Lisa and Joel – I’ve used Pocket but I’m finding using Flipboard magazine works well for referring back to articles. Perhaps I need to re assess?